SEJ's 17th annual conference took place earlier in the year than usual, September 5-9, with attendance hitting an all-new high. Our host was Stanford University, the theme "Innovation and Solutions." Multimedia coverage is here. On the agenda, you'll find descriptions of all the tours and sessions, and lists of speakers. Winners of SEJ's sixth annual Awards for Reporting on the Environment were announced. The 2007 Stolberg Award was given in honor of the late Mike Dunne, a founding SEJ member, assistant editor of the SEJournal, and senior reporter for The (Baton Rouge) Advocate. See SEJ's official conference coverage page, which includes audio, video, photos, as well as links to independent bloggers about conference happenings. Read speaker bios and see who the auto-test drive participants, exhibitors, advertisers and independent hospitality reception hosts were here. Questions or comments about the conference? Please contact the SEJ office. 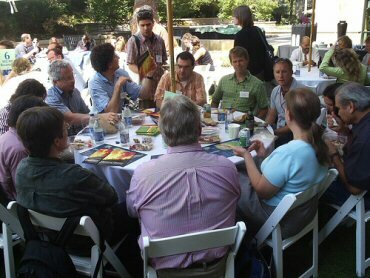 Photo: Network lunch. Credit: Amy Gahran.